Pet Life Today® is a free resource offering expert, researched information on pets. We publish pet care news, tips and pet product buying advice for owners of a wide variety of companion animals, from cats and dogs to hamsters and horses. Pet Life Today® is owned and operated by RKT Publishing, LLC, an organization founded in 2011 and one of the most trusted online content publishers, producing premium content that is designed to educate and inform a wide range of audiences. Dr. Jennifer Coates was valedictorian of her graduating class at the VA-MD Regional College of Veterinary Medicine and has practiced in Virginia, Wyoming, and Colorado. She is also the author of numerous articles, short stories, and books, including the Dictionary of Veterinary Terms, Vet-Speak Deciphered for the Non-Veterinarian. She lives in Fort Collins, Colorado with her husband, children, dog (Apollo), and cat (Minerva). Dr. Catharine Hennessy graduated from North Carolina State University in 2001 with a Doctor of Veterinary Medicine. She has practiced as a large animal veterinarian, and as a consultant for the pharmaceutical industry. She is currently a small animal veterinarian. Her passion is improving her clients’ lives by creating health for their dogs and cats. When not at work, she spends time with her husband, two sons, her chihuahua and three cats. Dr. TB Thompson has been practicing as a dog and cat veterinarian since 2000. She’s worked with exotic pets, wildlife, dogs, and cats in general practice and emergency pet hospitals. Dr. Thompson loves teaching people how to care for their pets in a gentle, sustainable way. With two amazing dogs and one awesome husband around, she learns something new every day about how to be happier in this world. Rob is a co-founder of RKT Publishing and CEO of Financial Recovery Technologies. He’s an experienced, entrepreneurial leader with a track record of success. Over twenty years he has co-founded four technology companies, and remains an active advisor, investor, and mentor for several Boston-area growth companies. Connect with Rob on LinkedIn. Ken is a co-founder of RKT Publishing, with 13 years experience in digital marketing and online publishing. He’s been featured in ESPN, Inc.com and Search Engine Land. Connect with Ken on LinkedIn or Twitter. Tom is a co-founder of RKT Publishing, with 10+ years experience in digital marketing and online publishing whose expertise has been featured in USA Today, Fox Business, and more. You can find Tom on LinkedIn or Twitter. Angela is the Executive Editor at RKT Publishing and oversees all content production and editorial policies for all RKT properties. She has 10 years experience in branding, PR and digital publishing and is founder and CEO of Coda Concepts. She’s been featured in Forbes, AMEX Open Forum and Business.com. Follow Angela on LinkedIn and Twitter. Lauren Corona is a regular contributor to Pet Life Today, as well as a range of other websites, pet-related and otherwise. Although she has experience with many kinds of pets, large and small, dogs are her true love, and she particularly enjoys writing about canine care and behavior. Lauren has been writing about pet care and pet products since 2010. She lives in England, in the beautiful Oxfordshire countryside, with her husband and their dog, Nola. Cynthia is the managing editor and frequent contributor. She lives with her husband in Southern California. Cynthia is passionate about helping pet parents create a healthy lifestyle through preventative healthcare and positive enrichment for a long, vibrant life of their four-legged friends. She’s raised and cared for many pets (mostly dogs), and has been writing about pet-focused topics, advice and trends since 2014. Jenny is a frequent contributing author for Pet Life Today. She’s originally from Central Ohio but has lived all over the world with her family, including Texas, Florida and Germany, among other places. She’s taken her two fur babies (and human ones, too) with her along the way and currently calls Eastern PA home. Jenny has been writing on all things pets (mostly focused on dogs) since 2015 and hopes to continue honing her expertise for many years to come. Emma is passionate about rescuing animals and providing them with a new life after being abandoned or abused. As well as their own four rescue dogs, Emma also fosters dogs for rehoming, providing them with love and training while searching for their forever homes. Ana is a frequent contributor at Pet Life Today. She comes from a sunny and warm region of central Serbia, but now she lives a little up north in the city of Novi Sad. Ana is passionate about helping pet owners provide their four-legged friends with the care and attention they need to be able to lead healthy lives. She had two cats named Ceca and Lunja while she was growing up, together with a parrot named Kica. Ana has been writing about pet-related topics, advice, and trends since 2016. Caitlin is a freelance lifestyle writer and a frequent contributor at Pet Life Today. Caitlin is based in the great white north in friendly Toronto, Canada. She lives with her husband, two sons, rescue dog, and cat. Caitlin is passionate about helping pet parents learn about the newest, trendiest, and most helpful products to help their four-legged friends live a long and happy life. She’s always had a pet in her life — from ferrets and cockatiels to mice, fish, dogs, and cats, and has been writing about pet-focused topics, advice and trends since 2012, and was previously the editor and contributor for Yahoo Canada Pets’ popular website. Melanie is a writer for Pet Life Today. She has more than 8 years of experience as an educator for AZA accredited facilities, including Tampa’s Lowry Park Zoo and the Florida Aquarium. She’s passionate about pet safety, holistic pet health, and trying out new products. She has been writing professionally since 2009. She has a Master of Fine Arts in Creative Writing from National University and a Bachelor of Arts in Writing from the University of Tampa. She lives in Tampa, Florida with her three dogs, husband, and son. 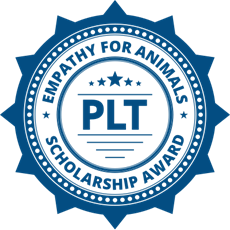 Offered through Pet Life Today, this scholarship is open to veterinary students enrolled in veterinary studies, animal sciences or a similar undergraduate program at an accredited university, and awarded annually in the amount of $500. Through RKT Publishing, Pet Life Today is a participant in the Amazon Services LLC Associates Program, an affiliate advertising program designed to provide a means for us to earn fees by linking to Amazon.com and affiliated sites. We include Amazon links to many of the products we feature on our site. If you click on one of those links and make a purchase on Amazon, we receive a small percentage of the purchase price in the form of a commission directly from Amazon. You can read more about The Amazon Affiliate Program here. This is how we’re able to fund and support the work we do at Pet Life Today, so that we can bring you the best pet news, tips and product buying advice for pet owners and remain a free and unbiased resource.